The year 2014 brought an interesting flip in how Terry and I do things. For a number of years we have been creating a calendar from the photos of our trips. Initially the pictures were all mine. But as Terry got interested in photography we started including her photos as well. The first year that we included Terry’s photos three of the twelve were hers. At the same time that Terry was getting more interested in and getting better at photography, I was hit by the realization that trying to get the right picture was interfering with my enjoyment of the particular moment. I also realized that I wanted to communicate more through my writing. This meant that the balance of the calendar continued to shift. For our 2013 calendar Terry had nine photos and I had three. 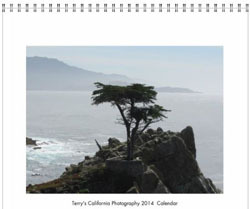 And then this year, our 2014 calendar, all twelve photos were Terry’s. I’m fine with that. Terry is a good photographer who keeps getting better, and I enjoy writing.